First let me say this: I love patios. The wind in your hair, the sun on your face, the hot waft of a garbage trunk barreling down the street. It’s all part of the glory of summer in Toronto. But I do have a bone to pick with a patio that is currently occupied by La Carnita/Sweet Jesus on John Street just south of Adelaide. My bone? It’s supposed to be a public space. As in no fence around the edge. As in I don’t need to buy something to sit there. You know, open to everyone? What makes this extra annoying is that King-Spadina is one of the densest, rapidly-growing, open space poor neighbourhoods in the entire city. The fact that we created a public space (however itty bitty) and then had it taken away so people could eat over-priced (but Instagrammable) ice cream cones is just the pits. We need all the slivers of public space we can carve out in this city, especially in the downtown, and especially especially in King-Spadina. The space is meant as a POPS (privately-owned publicly accessible space). 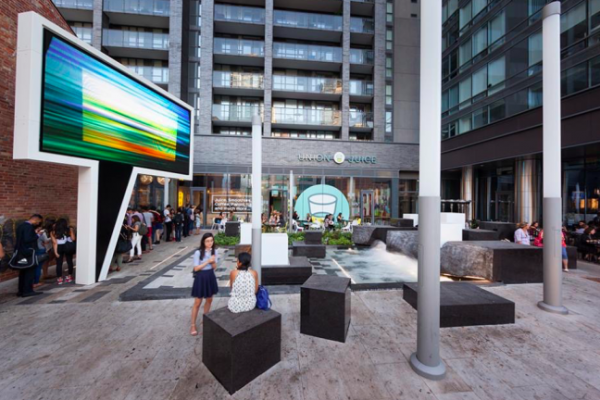 These are spaces created through the development process in Toronto where developers get extra goodies (height, maybe, or chocolate) in exchange for creating and maintaining publicly-accessible open spaces on their property. We have a ton of these in Toronto, many of them in the Financial District. (My favourite POPS is the TD Centre “pasture” where all those lovely cows like to hang out all day). Here’s a map. So turning this space into a private patio for a business is basically the opposite of what is supposed to be happening here. It also highlights the challenges of using POPS as ways to create “public space” in highly dense, rapidly developing areas. It’s an attractive tool for the City for sure–you get some new public space and you don’t even need to maintain it! But hiccups like this show why we need to be cautious with these spaces, and why we certainly don’t want them ever to be seen as a substitute for a publicly owned park or plaza. One clear example of this was highlighted on a Jane’s Walk I went on two years ago (led by City Staff) where we were approached by two security guards as we stood in a POPS to talk about it. These are still, ultimately, privately-owned spaces. I contacted Councillor Joe Cressy’s office to ask about this and was told by his staff that he’s aware of the issue, does not approve of what’s happening, and has instructed the city’s legal staff to look into it. Hopefully we can expect some action soon. Yes, patios are cool. But we can’t let these things slide if we’re going to protect the spaces that we’ve managed to create for the public to use. Tear down the fence, people. This post was originally posted on This Land is Parkland, a blog about open spaces, large and small. Jake Tobin Garrett is the manager of policy and research at Park People. What happened to the POP that use to be located in Shops on Don Mills? It’s not indicated on the map that is linked to this article. Is Cadillac Fairview trying to make everyone forget that its a POP? 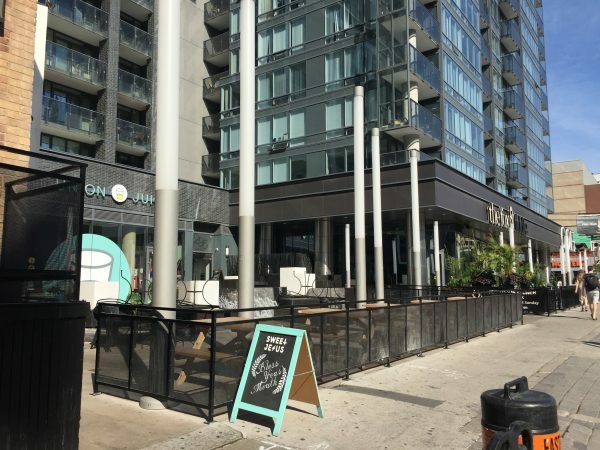 Does the LCBO still require patios to be closed to the public? In the rest of world, okay except in some U.S. states and Moslem countries, the patios are open. What are the rules around POP accessibility? A nearby condo has a nice one I’d like to use more (it’s a handy shortcut and generally pleasant) but it is locked up for 3/4 of the day.